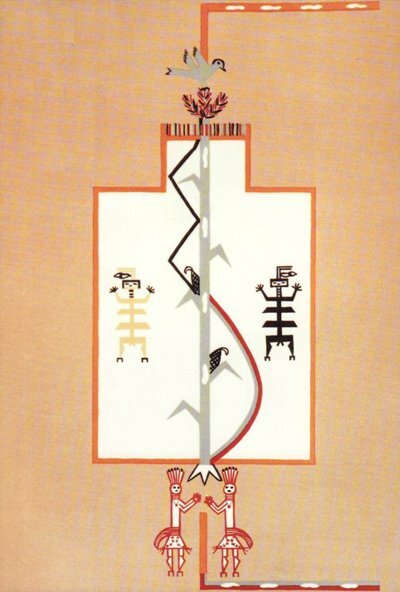 A Navajo sand painting, New Mexico, c. 1950, dissected in Joseph Campbell‘s The Inner Reaches of Outer Space, 1986. Such paintings, composed of colored sand strewn upon a hogan’s dirt floor, are used in healing and initiation ceremonies, wherein an assemblage of friends and neighbors chant and encourage an initiate, physically entering the painting, to [re]embark upon and [re]live a mythic adventure. Starting at the bottom, “the footprints represent a spiritual ascent along the mystic way known to the Najaho as the Pollen Path” (p93). “The two colors of the ‘female’ and the ‘male,’ lunar and solar powers… become one on passing between the guardian Spirit Bringers at the entrance to the sanctuary; the path, which is now of the single color of pollen, runs to the base of the World Tree, where three roots or ways of entrance are confronted” (p97). “The bounded area is equivalent to the interior of a temple, an Earthly Paradise, where all forms are to be experienced, not in terms of practical relationships, threatening or desirable, evil or good, but as the manifestations of powers supporting the visible world and which, though not recognized in practical living, are everywhere immediately at hand and of one’s own nature” (p93). The painting abounds with symbols, correspondences, archetypes, and hierophanies: the axial Great Corn Plant, its threefold root, the blue bird, its threefold perch, the lightening flash that “strikes to the exact center of the way” (p94), the yellow and black apparitions, the color system, the turns of the path, the number of corn ears and their placement. See Campbell’s expansive discussion. “The ordeal is an act of sacrifice. The mind is to abandon forever the whole way of relating to life which is of the knowledge of the two powers of the path only as distinct from each other, red and blue. Beyond the exit gate, returning to the world, the path is to be no longer red and blue, but of the one color of pollen. The neighbors and friends who have gathered to witness the occasion will experience an exaltation, but then return to the world along the path by which they came… whereas the initiate, nearly naked and decorated as a god, will have become identified with the adventure” (p101). Great page you have, one of the best Pollen Path references on the Internet. Thank you. I wanted to use the picture on a web site. Is there any issue with copyright?? if so, who would I have to contact to get permission to reproduce the picture? This story, with the excerpts you told, is pretty much the Corn Male/Female journey of the 20014 film Interstellar. Corn pollen blowing is a big theme of the film. When you view the Film through Campbell’s education and many many viewings – it has a much more to speak about North America – politics, NASA, secrets in science, World War 3, Compassion, etc.